One of the false ideas prevalent in jazz circles is that the records produced in California in the 1950s were, in the words of one critic, "bloodless museum pieces, a neatly packaged soundtrack for the cold war." And, if you listen to jazz programmes, you will hear few examples of West Coast Jazz. The occasional Gerry Mulligan or Chet Baker disc will creep in, but it's rare to hear music by Chico Hamilton, Conte Candoli, Bob Cooper, Bud Shank, Herbie Harper, and Lennie Niehaus, to mention just a few of the excellent musicians working around Los Angeles in the period concerned. It needs to be said that it's also rare to hear much of the white jazz played in New York around the same time, and Nick Travis, Sam Most, Eddie Costa, Joe Puma and others like them, are consigned to near-oblivion. It's almost as if there is an unspoken assumption that the only 1950s jazz worth remembering is the hard bop played mostly by black musicians and very often recorded for Blue Note. This isn't to suggest that it isn't worth listening to, but simply to point out that a lot of other good music was also put on record. I'm tempted to say that a kind of reverse racism almost applies, with black being good and white being bad, but it may be that it's actually a case of the kind of amnesia that marketing and the need to stay in fashion produce. People forget the past until it's conveniently revived for them in easily-identifiable packages. But I don't want to extend this argument, and my intention is to point to the liveliness and charm of many examples of West Coast jazz." Charm" isn't a word used often in the language of jazz criticism, and it certainly couldn’t be extended to describe tough, hard bop, but it does apply to at least some of the music from 1950s Los Angeles. West Coast Jazz was efficiently marketed, and there was a degree of truth in the assertion made by black musicians in California that it often left them out, the packaging tending to highlight cleancut, young white musicians wearing neat suits or casual clothes. Sun, good living, tidy jazz, and regular earnings, were all suggested by the album covers. It wasn't exactly true of the lives of some of the musicians, of course, and you only need to read about the activities of Art Pepper, Joe Maini, Gary Frommer and others to realise that the jazz life, even in sunny California, still involved a great deal of scuffling and more than a little personal waywardness. But some musicians did make a comfortable living in the film and recording studios, so they didn't need to rely on jazz for their bread-and-butter money. Black jazzmen like Teddy Edwards, Harold Land, and Hampton Hawes, who had been around Los Angeles since the heady days of 1940s bop, could be forgiven for thinking they were treated unfairly, though it isn't accurate to say that they were denied the opportunity to record in the 1950s. It may have been that the West Coast boom actually provided more opportunities than they would normally have had. Jazz on the West Coast didn't arrive in the 1950s, of course, and Central Avenue in Los Angeles had been a mecca for some leading modernists in the mid-1940s. Dexter Gordon, Wardell Gray, Howard McGhee, and Sonny Criss were active in the clubs and on records, and Charlie Parker lived in California for several months. But things slackened off at the end of the decade, and when the 19505 began there was something of a feeling that not a lot was happening. It was a time when modem jazz was hovering between movements, with be-bop coming to the end of its dynamic, experiential period, cool jazz edging in, and some musicians who were to be influential later in the 19505 - Miles Davis, Art Blakey, Sonny Rollins, for example - being relatively inactive. These are generalisations, because things don't begin and end in clearcut ways and individual jazzmen often escape being put into one category, but there was a move towards jazz that was less intense than bop. The music was not necessarily any less complex - listen to Lennie Tristano, and his followers like Lee Konitz and Warne Marsh for jazz which is highly cerebral - but a quieter, more relaxed approach was often in evidence, as witness the playing of Stan Getz, the work of the George Shearing group, the tidy style of Red Norvo's bright trio, and the rise of the whole gang of cool tenormen, such as Phil Urso, Al Cohn, Zoot Sims, and Richie Kamuca. On the West Coast, there was an influx of young, modern jazzmen. Many of them had been in the big-bands of Stan Kenton and Woody Herman and others moved to the area because of the possibilities of studio work. 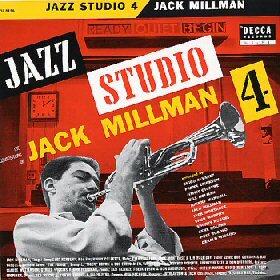 Shorty Rogers, Claude Williamson, Art Pepper, Bud Shank, Bob Cooper, Shelly Manne, Stan Levey, and many more found the combination of a decent climate and regular work was attractive. Not all of them were West Coasters, in the sense of having been born there. Jazz musicians, especially in the days when big-bands toured the country, went where the work was. But whereas, in the past, New York had been the home base for most modernists, Los Angeles now provided an alternative. Some slightly older musicians, such as Herbie Harper, Howard Rumsey and Roy Harte, were already there, and it was Rumsey who was perhaps responsible for giving West Coast Jazz both a physical location and a sense of musical direction. In 1949 he persuaded a reluctant club owner to try a series of Sunday jam sessions, thus giving birth to the famous Lighthouse at Hermosa Beach, where so many local musicians and visitors appeared and where new ideas were put into practice. The sessions at the Lighthouse were often necessarily fluid in terms of the music, at least in the early days. Recorded evidence shows that a loose, jam session mood predominated, with a basic theme stated by the ensemble followed by a string of solos. The sound isn't particularly West Coast, at least not in the way that later, more-organised music was. Many of the players had cut their teeth in the 1940s and bop ideas influenced their solos. There are some interesting sessions from the Lighthouse in 1953 which find West Coasters like Rogers, Shank, and Cooper, playing alongside the Swedish trumpeter Rolf Ericson, hop drummer Max Roach and Miles Davis. In addition, pianist Hampton Hawes, a West Coast resident influenced by the music of Charlie Parker and other boppers, also present, and the ill-fated Lorraine Geller and the now-forgotten Frank Patchen appeared on some tracks. The point I'm making is that the music was not easily categorised, and only the most prejudiced listener would want to describe it as lacking in vitality or invention. Some other early-19505 albums, compiled from sessions at The Haig and Trade Winds, two Los Angeles clubs, likewise highlight the mixed nature of modern jazz on the West Coast. Tenormen Wardell Gray and Dave Pall work together comfortably, the bop altoist Sonny Criss is heard with cool stylist Chet Bakerand there is a general mixture of white and black musicians mostly playing bop classics or tunes from the standard song repertoire. What is true is that many of the white musicians had been impressed by the twelve tracks recorded by the Miles Davis band in 1949 and 1950. These were the famous "Birth of the Cool" records on which the ensemble playing and the quality of the arrangements were as important as the solos and provided a background against which the soloists could fashion something thoughtful, relaxed, and cool in tone. Gil Evans is often credited with being a major influence in the shaping of the Davis band's style, but Gerry Mulligan provided several of the arrangements and it his influence which carried over to the West Coast, where the musicians wanted to play in a lively, bright, and well-organised way. An early example of what they were after was provided by Shorty Rogers in 1951 when he recorded six sides with a group which included a tuba and french horn alongside the usual tenor, alto and trumpet found in most modem jazz units. There has been a tendency to relate the Rogers recordings to those of the Davis band, and to rate them as lesser achievements, but this is unfair. Rogers didn't set out to copy Davis, and in any case had experience of writing for large groups when he worked with Woody Herman and Stan Kenton. His arrangements were energetic and imaginative and they allow the soloists far more freedom than was evident on the Davis sides. In their way, they typify what was best about West Coast jazz, with their crisp and humorous charts providing a framework for solo work that may be cool but is always spirited. What I've done so far is to describe, in a general way, what had happened prior to 1953 or so. There were other major developments, including the impact of the Gerry Mulligan quartet with Chet Baker, the rise of Dave Brubeck and Paul Desmond and the increasing presence in the recording studios of people like Frank Rosolino, Bob Cooper, Bud Shank and Shelly Manne, often as members of Howard Rumsey's Lighthouse All-Stars. When it became obvious that something was coming out of the West which could be clearly said to be unlike jazz produced in New York, the record companies began to market it accordingly. After 1953 West Coast Jazz boomed and recording facilities became available to all and sundry. Some writers have carped about this situation, but it seems tome that it allowed a large number of interesting musicians to make a contribution to the overall development of jazz. They weren't necessarily major jazzmen, but their work provided a backcloth against which the leading figures could perform. And it made for variety. There were also a few occasions when some of these minor musicians could produce work which - fresh and original, and had that attribute I referred to earlier- charm. it's possible to talk in general terms about these small, but valuable achievements, but perhaps more interesting to look at the careers of three musicians who ware responsible for some of them. I mentioned earlier that Shorty Rogers used a french horn on his 1951 recordings, and it was played by John Grass. He was born in 1924 and worked with symphony orchestras in the early 1940s before joining Claude Thornhill's band, which was acknowledged as the first to have the cool approach. More classical experience followed and then stints with Tex Beneke (when the ex-Glenn Miller saxophonist had a large outfit which included a string section) and Stan Kenton. Grass then settled in California so that he could work in the film and recording studios. He also involved himself with the jazz scene, as the Rogers recordings show, and in 1953 was offered a recording date under his own name by Trend, a small West Coast company. One of the accusations levelled against West Coast Jazz was that the groups, particularly those assembled for recording sessions, were often comprised of the same small group of musicians who simply handed the leader's hat round amongst themselves. And, looking at the line-ups, there could be some truth in this, though it's more likely that it was a case of people of like-minded interests being in close touch and inviting their immediate contacts to participate. The Graas group included Shorty Rogers, Bud Shank, Bob Cooper and Shelly Manne, all of them central to West Coast Jazz. Working within a small group framework, Graas and his arrangers, and they included Rogers, Jimmy Giuffre and Nelson Riddle, managed to produce music that was light, varied and inventive in its use of shading and dynamics. There were little experiments with time, as on the aptly titled 6/4 Trend, and often an intriguing use of Latin American rhythms. A couple of the titles, Egypt and Pyramid, seem to nod in the direction of the Middle East, but the rhythmic impulse behind them has more to do with Cuba than Cairo. Not that it matters, because the sound is intriguing enough in its own right. Graas's french horn is used effectively in the ensemble passages and as a solo instrument, and the other soloists, once they cut loose from the arranged passages, demonstrate that they could be forceful and humorous. Rogers and pianist Russ Freeman are especially effective in this regard. The music did not have the edgy brilliance of the best be-bop, nor was it as carefully intricate as the cool experiments of Lennie Tristano and Lee Konitz, but it provided a useful contrast to the harder, more intense sounds that were coming from the East as Miles Davis, Art Blakey, Kenny Dorham and Sonny Rollins, pushed their kind of jazz into prominence. Note that I use the word contrast", because it seems to me that the varying approaches to the making of jazz are valid. Graas continued to work throughout the 1950s and his records maintained a consistently high level of performance. A 1954 date gave him and some other West Coast musicians, such as trumpeter Don Fagerquist and the outstanding alto player Herb Geller, an opportunity to stretch out on tracks like Laura and Here Come The Lions, both of which are lively and good-natured. Perhaps the best item from this session was Graas Point, with the small group producing a very full sound and providing sensitive backing for soloists. Fagerquist, a trumpeter who mostly worked with the big-bands, has been neglected by jazz writers, but his playing here is particularly good, his tone and ideas combining to give the impression of delicate insistence. The piece also incorporates a fugue-like sequence which reflects the interest and often the training that many West Coast musicians had in classical music. Other examples can be found on Graas records, as in Petite Poem, part of a sonata by pianist Paul Moer, and Jazz Overture, composed by Graas for a jazz opera. He also worked on a symphony combining both jazz and classical ideas, selections from which were used on his albums. What came across in his music was a sense of discovery, and a searching for a way to blend jazz and classical music without abandoning the beat or the improvisational strength that lies at the heart of Jazz. He may not have been totally successful, but he did attempt to move beyond the usual format of a simple theme statement followed by a string of solos. And everything he did had individuality, as witness his version of Lionel Hampton's Midnight Sun, which is, unusually, taken at a fast tempo and highlights solos by Art Pepper and Bob Cooper, or his neat arrangement of the popular song Inch Worm. 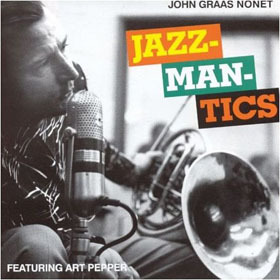 John Graas died in 1962, so never achieved his full potential, but the music he did make is still worth hearing. Graas was relatively well known on the West Coast scene, and the handful of surveys of it usually mention him, but Jack Millman gets little or no recognition of his existence. A trumpeter, arranger, and early devotee of the fluegelhorn, he had some Big Band experience with Stan Kenton in the 1950's (he was born in 1930) and led his own groups m California. Millman had sound musical training and composed a jazz symphony, but his appearances on records were limited. For a 1955 session under his own name he brought together an impressive array of musicians, including Shorty Rogers, Maynard Ferguson, the talented baritone saxophonist Bob Gordon who died in a car crash later the same year, and Herb Geller. He also added Latin American rhythm instruments for several tracks and used a flute and a vibraphone to further vary the music. Bolero de Mendez features a flute across a rolling rhythm, Pink Lady neatly intertwines flute and vibraphone, and Just a Pretty Tune similarly uses both instruments to good effect. Millman clearly liked ensemble sounds and Ballad for Jeanie emphasizes that aspect, while When You're Near, has an introduction in which muted horn, tenor and guitar combine. Millman himself was not an outstanding soloist, nor did he try to be, and his work is shaped to fit in with the group rather than dominate it. A 1957 Millman date found him with a smaller group, though again the imaginative use of flute and clarinet adds to the range of sounds on offer. He had a taste for good tunes - Cathy Goes South from the earlier session was a very attractive theme - and his versions of standards such as Skylark and Polka Dots and Moonbeams are notable for the care with which he handles the basic materials. There are few diversions from the original melodies. Elsewhere, he takes Gone With the Wind at a brisk pace, adds some attractive ensemble passages, and uses Latin American rhythms to keep things bubbling. And on the Great Lie, the tune from the 1940's the low keyed clarinet of Jimmy Giuffrey is spot lighted. Was all this great jazz? No, but it was very appealing and pleasant to listen to, and why decry that kind of achievement? Millman made just one more session in 1957 and then seems to have faded from sight. Perhaps the best known of the three musicians I have chosen to write about was Dave Pell, a tenor saxophonist and band leader whose reputation was established when he worked with Les Brown's Band between 1947 and 1955, and who recorded extensively with his own groups in the 1950s. In some ways Pell came to be seen as almost personally responsible for the perception of West Coast jazz as bland, over-arranged and lacking in spirit, and musicians and critics referred to his music as Mortgage Paying Jazz", or "Grey Flannel Suit Jazz", and described it as designed not to disturb anyone. Pell himself appeared to accept the criticisms and sounded almost apologetic when asked about his records, but he possibly under-rated his minor, but not inconsequential skills. His groups always employed competent musicians, some of them from the Les Brown band and others from the general pool of West Coast jazzmen. The earliest album under Pell's name was recorded in 1953 and was built around a selection of Irving Berlin songs (Pell later recorded material by Rodgers and Hart and generally drew from the classic period of American song writing) which ware arranged by Shorty Rogers, Bill Holman and Jerry Fielding. Rogers arrangement of I'm Putting All my Eggs In One Basket is taut and gives solo space to the excellent Don Fagerquist, and Jerry Fielding's version of Change Partners has an intriguing opening and a slight Latin American flavour. Tracks such as these were short and neither arrangements nor solos were breaking new ground, but they had what I mentioned earlier - a charm that can disarm most criticism. Some of Pell's best small group work cropped up on a number of tracks from Capitol which were recorded in 1955 and 1957. Both sessions drew heavily on the Brown band, though the earlier one used baritone player Bob Gordon. First rate arrangers were also involved, including Marty Paich, Jack Montrose, and Andre Previn. A fine trombonist, Ray Sims, soloed on People in Love, and Gordon was featured on I Had the Craziest Dream, Star Eyes, My Heart Belongs to Daddy, and a delightful dance around the old Shirley Temple number On the Good Ship Lollipop. It was this kind of music - bouncy witty and brief - which persuaded some purists that West Coast jazzmen were not to be taken too seriously, and yet it has retained much of its interest in the ensuing forty years and may, in fact, have lasted better than some longer and looser performances. Why denigrate the moody version of Time After Time with its moving Don Fagerquist solo or the spirited romp through Star Eyes? Listening to these records now one is constantly aware that although they were tightly arranged and played with great skill the musicians were never slaves to precision. They swung, albeit lightly, and within the limited framework came up with original solo ideas. There were other interesting Pell records, including one which spotlighted trumpeter Jack Sheldon and trombonist Bob Burgess and supposedly aimed for a broader jazz feeling, but the Capitol album has always seemed to me one of the best of its kind. The tracks are also good to listen to because of the way in which they focus attention on forgotten or neglected musicians. Bob Gordon died too early to really make a mark, but the music he left behind is all good. His style, not unlike Gerry Mulligan's, though digging in a little deeper, seemed likely to place him amongst the leading exponents of the baritone saxophone. And Don Fagerquist, who I've mentioned several time, surely ought to have been better regarded? His solos, scattered around 1940's and 1950's Big Band records by Gene Krupa, Woody Herman, Artie Shaw, and Les Brown, were always well shaped as ware his contributions to the Pell records on which he appeared. Fagerquist made only one album under his own name at the time of the West Coast boom, but it is worth trying to track it down. Like Pell, he had a taste for good songs and his immaculate work on Smoke Gets In Your Eyes, Easy Living and All the Things You Are is both imaginative and subtle. Obviously I have considered only a handful of West Coast jazz records and I would accept they are not necessarily the best from a jazz point of view. That wasn't what I was looking for, and performances by Conte Candoli, Stu Williamson, Bill Perkins, Art Pepper and many more would need to be taken into account if one wanted to evaluate the level of improvisational skill achieved by West Coast jazzmen. A musician like Candoli, for example, came up with some solos which stand comparison with anything produced in New York but he has never been given the recognition he deserves. But my main aim in this piece was to point out that a lot of the music dismissed as shallow or undemanding was, in fact, good in its own way. If the more jazz inclined records that came from the West Coast are added to the big band tracks, the excursions into Latin American rhythms, the experiments with instrumentation, and the kind of good natured, easy swinging music I have described, it will be seen that the Los Angeles scene produced a great deal that was exciting, innovative, and good to listen to. And much of it is still interesting.